Introducing the NEW vLetter Super SmartFonts! vLetter’s new Super SmartFonts handwriting fonts add a number of new features to our SmartFonts. Each font has special capabilities unique to its own style and include a full international western european character set. Handwritten letters and envelopes made with these new Super SmartFonts handwriting fonts contain all the personality and emotion of real handwriting. These fonts are great for producing handwritten letters, cards, scrapbooking, mail merges for direct mail, and more. 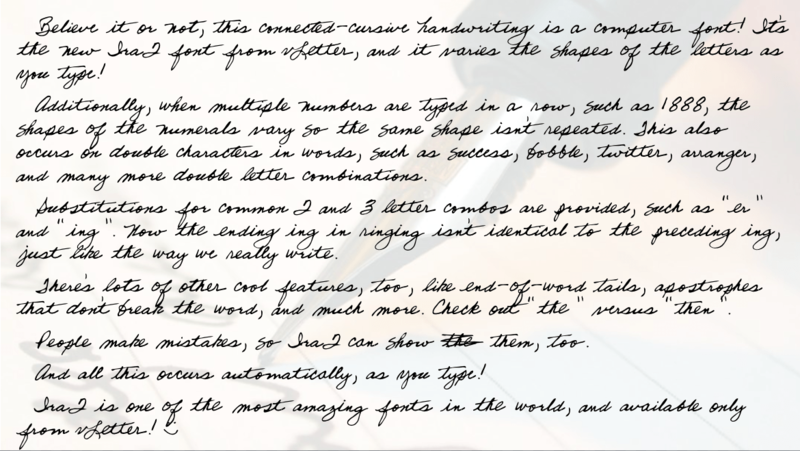 These new Super SmartFont cursive handwriting fonts utilize OpenType font technology and vLetter’s proprietary cursive handwriting font technology to create the real connected cursive and contextual variety of natural handwriting. Now vLetter has raised the bar even higher. It’s a super font, and priced accordingly at $99.95. Also view our selection of SmartFont Ready-Made Handwriting Fonts! $99 ea. Click on the handwriting image below to see a full sample of the font. DaveSharpie, the new Super-Smart upgrade of our SmartFont Dave, now offers a super-bold version especially made for direct mail. DaveSharpie provides an ultra-realistic semi-connected character set plus a plethora of custom common word and multiple letter variations. The full western European character set is included along with accented characters, diacritics, and punctuation. It also offers new features such as multiple sets of each numeral (perfect for addressing envelopes! ), multiple variations of words, word endings, mistakes, emoticons, double character variation, custom street and direction variations for envelope addressing, and much more! There are no other fonts in the world like vLetter SmartFonts. Dakota2, the new Super SmartFont version of the popular Dakota print font, introduces all the variations and more of these flagship handwriting fonts. The full western european character set including accented characters, diacritics, and punctuation. It also offers a new features such as multiple sets of each numeral (perfect for addressing envelopes! ), multiple variations of words, word endings, mistakes, emoticons, double character variation, and much more! There are no other fonts in the world like vLetter SmartFonts. Ira4, the new upgrade of our Super SmartFont Ira3 and Ira2, now offers a full western european character set including accented characters, diacritics, and punctuation. It also offers a new features such as multiple sets of each numeral (perfect for addressing envelopes! ), multiple variations of words, word endings, mistakes, emoticons, double character variation, and much more! There are no other fonts in the world like vLetter SmartFonts. Sire4 is a fully contextual printed (not connected cursive) font that provides so many variations in the characters that it’s difficult to tell it from real handwriting. Like our other Super SmartFonts, Sire4 also offers a host of features such as multiple sets of each numeral (perfect for addressing envelopes! ), multiple variations of words, word endings, mistakes, emoticons, double character variation, and much more! There are no other fonts in the world like vLetter SmartFonts. Tsui4 is a fully contextual connected-cursive font that provides a very realistic handwriting appearance. Tsui4 is especially suited to direct mail applications such as for addressing envelopes or personal appeals and fundraising. Like our other Super SmartFonts, Tsui4 also offers a host of features such as multiple sets of each numeral (perfect for addressing envelopes! ), multiple variations of words, word endings, mistakes, emoticons, double character variation, and much more! There are no other fonts in the world like vLetter SmartFonts.